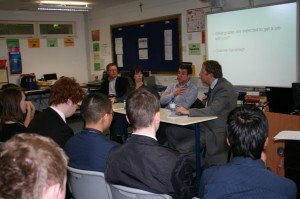 As part of our continued commitment to supporting young people and education Etherlive recently took part in the St. Joseph’s career’s day sitting on a ‘Question Time’ style panel. Four sessions of 40 students each took place throughout the day asking probing questions of the businesses who spoke candidly about the challenges of young people starting their careers. Questions from the audience focused on a range of topics from the practical, like tips and tricks for interviews, to discussions around what help businesses are receiving from the government to encourage hiring young people. The aim of the day was to give an insight into the way businesses recruit and help students weigh up their future options. Tom McInerney from Etherlive was among several panellists, many of whom are also part of the Swindon Strategic Economic Partnership, including St. Joseph’s governor Rob Collins a partner with Withy King, and Ramona Derbyshire a partner from Thring Townsend Lee & Pembertons.